Besides beaches, Valencia has many attractions for tourists to enjoy. It is a city with a rich cultural, historical monuments, museums, churches and religious buildings, and you can also visit parks and gardens. Besides Spanish courses in Valencia agency Linguaschools have an extensive cultural program. This is an excellent opportunity to visit best places of city guided by teacher of school. 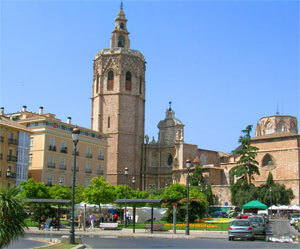 Miguelete Tower: One of the most symbolic monuments of Valencia, is the bell tower of the cathedral. From anywhere in the old town you can see this tower over all other buildings. Is 63 meters high, is a strong tower of solid appearance, has few windows and on top is the great hour bell. If you want to climb to the top in order to have a wonderful view of the city, you have to climb 207 steps that form the spiral staircase, but worth the effort. The city of Valencia is a beautiful building consisting of a ground floor plus two floors and a central tower. It was designed by architects Francisco Mora and Carlos Carbonell. On the outside we can see its beautiful domes, windows and balconies. But if you also give around inside to stay really delighted to see the decorations of the rooms and the staircase. In the museum are historic city and paleontology museum. Generalitat Palace: It is a splendid building, built in the Gothic style. During his visit will see the Golden Hall, the Hall of Cortes set out in paintings and art-worked wood. The building is decorated with ceramic forming images. A recommended visit. The Museum of Fine Arts: Any museum with these features in captive, and even more this exposes a valuable collection of works of art of the highest quality. It is one of the most important art museums in Spain. In addition it also contains pieces of archeology. The Cathedral: Its construction mixes Gothic and Roman styles. No highlights as all and each of the component parts are magnificent. Doors, chapels, halls, the steeple of Miguelete named above, the museum, everything is truly a visit not to be missed. Las Torres de Serrano: It is a National Historic Landmark and was declared in 1931. It was the city's main gate by the wall, today is only the door in the middle of the towers. The most interesting part of this is that it is very different from front to back. The Lonja of Valencia: In 1931 it was declared a National Monument, and in 1996 as a World Heritage Site. It is an admirable Gothic monument, has a lot of history, thanks to the Valencia could position itself among the first Spanish cities commercially. It is a very large building with towers and rectangular windows, all worked Gothic and Renaissance style. Inside is even more beautiful, more so the main room with the vault. Las Torres de Quart: was the door through which one could cross the medieval walls in antiquity. They are two cylindrical towers, not decorated as was used for the defense of the town. In the middle of the towers we have a robust wooden door. These are just some of the monuments, as there are many more. But besides these that have great historical value, we can not name the most modern buildings in the city. City of Arts and Sciences: It is a great modern center designed by Santiago Calatrava. It has an area of ​​350000 square meters in which there are 4 complex futuristic style. No one person is not left in awe of such a work of art as it is this part of the city. The Palau de les Arts Reina Sofia: Dedicated to the dances, plays and musicals. The building is 70 meters divided into 4 rooms. Hemisfèric: This building was created in the shape of an eye, including lid that opens and closes. This was done in order to represent the function of the building that is to screen films. Science Museum Principe Felipe: The building looks like the skeleton of a whale. In houses a science museum. Oceanogràfic: A marine park, a visit unforgettable.